With so many Italian pizzeria restaurants paving the streets of London, which is the best to choose? You cant help but stumble upon a quaint little Italian at every corner of the city, but the real trick is keeping tabs on the good ones! Whilst so many Italian restaurants promise delicious, authentic Italian fare, theres nothing more disappointing to find that in fact, you could have grabbed a better pizza at your local Pizza Express. Plus, with Italian being one of my most coveted cuisines, Im a little fussy about getting it just right. Having said that, Im partial to a great-value pizzeria with generally good Italian dishes. And thats exactly what Bianca 43 promises to deliver: fuss-free, tasty Italian fare, at affordable prices. With sister restaurants in Blackheath and Greenwich, the central-London venue is the newest of the branches, locatated in the heart of bustling Trafalgar Square. A great central location amidst a plethora of tourist hotspots, making Bianco 43 the perfect place for a spot of lunch or dinner, after an afternoon of sightseeing or a day of indulgent shopping! The restaurant itself is light, airy and sophisticated. Its casual dining at its finest. With marbled pillars and sky-high, soaring ceilings, rustic wooden tables scattered amidst the spacious restaurant, and a sleek, shiny Neopolitan pizza oven taking centre stage of the open kitchen. Its unassuming, yet chic with a touch of Italian contemporary glamour. The staff are friendly and eager to help, and were swiftly seated, ready to peruse the extensive menu. Were tempted by the Aperol spritz aperitifs, but as its a school night, we modestly opt for a palatable bottle of Italian Chianti, in-keeping with the Italian surroundings, of course. The wine list is impressive, with a good selection of mid-range to more expensive vintages, mostly sourced from Italy, with a few French grapes thrown into the mix. Although pizzas are their speciality, theres a good choice of alternative meat, fish and pasta dishes to choose from, and a mouthwatering antipasti selection to get stuck into before the main event. There are the usual Italian contenders like bruschetta or mozzarella and tomato salad, but we opt for the crispy calamari with zucchini fritters and tangy tartare sauce (great for garlic fiends like myself, not-so-great for those who arent!). Its fresh and delicious. The crispy batter is rich and crunchy and the garlic-laden tartare sauce adds that extra kick to the melt-in-the-mouth calamari rings. A definite winner in my book. Divine! Simple yet tasty and authentically Italian. Stone-baked with a slightly crusty blackened dough, thats crispy around the edges, yet soft in the middle, topped with torn strips of creamy mozzarella and a rich Neopolitan tomato sauce. I choose the Capricciosa; a medley of my favourite ingredients: spicy Italian salami, thin slices of mushrooms and salted black olives. 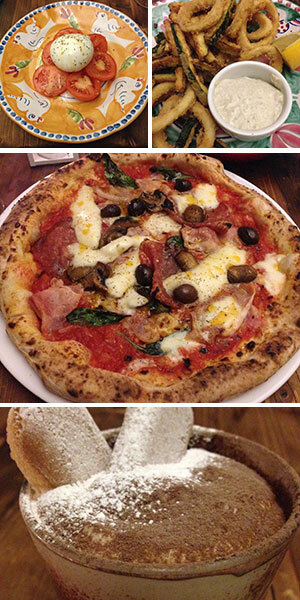 A gorgeous combo of traditional Italian toppings, that taste truly fabulous. Not being much of a desert fan, Im pleasantly surprised by our Homemade Tirimisu. Its rich and creamy with the perfect balance of bitter coffee and sweet dessert wine, infused into the soft sponge layers. Another delectable dish to end the evening on a high, and were suitably impressed with the winning Italian fare Bianco 43 has to offer. The menu is affordable, with a great choice of dishes to suit a variety of tastes, but most importantly, the food is authentic and tastes delicious, so definitely worth a visit if you find yourself in the area.